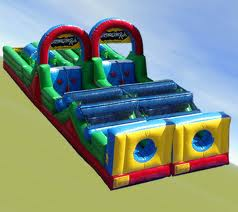 South Hadley bounce house rentals offers several types of obstacle course rentals in South Hadley, MA. We are happy to be doing many of the schools in South Hadley, MA end of year kids fun days. Obstacle courses are great for any event that there will be a group of kids. Kids will not feel left out or waiting because the kids can keep two lines formed at the entrance of obstacle course rental. They will move through the obstacle course through the holes and multiple pop up pylons, than over the rock climbing wall down the slide, through tunnels and more obstacles and than race out the finish hole. We also do many other types of inflatables bounce house rentals, water slide rentals, and Tent rentals in South Hadley, MA.